Facing a Saturday with not much to do we decided that we would jump in the car and head up to Bruthen. You see The Bullet Brewery is a placeIi have always wanted to visit for a few beers and a meal. It is just one of those things: life, time and the opportunity had alluded us until this point. 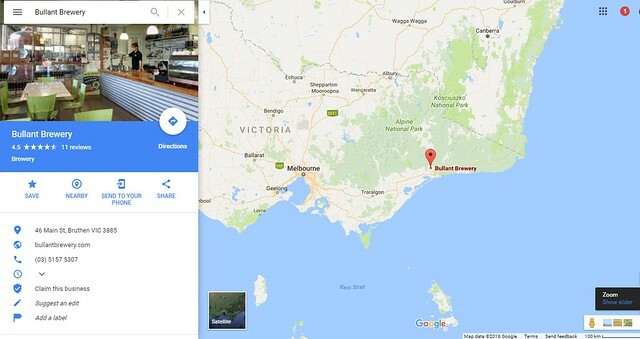 The Bullant Brewery is 88 km from our home readily reached in just under an hours time from our front door to their beer deck at the brewery. Bruthen is a small town with a few shops, service station and a Brewery, yes a Brewery, why not? Bruthen is the gateway to the East Gippsland Ski resorts of Mount Hothan and Dinner Plain. The town is now also on a popular by-pass road that shortens the trip from Bairnsdale to Orbost in East Gippsland. We were greeted by Cameron as we walked in. Cameron asked us whether we wanted to sit inside or outside. Being the middle of winter we still chose to sit outside. 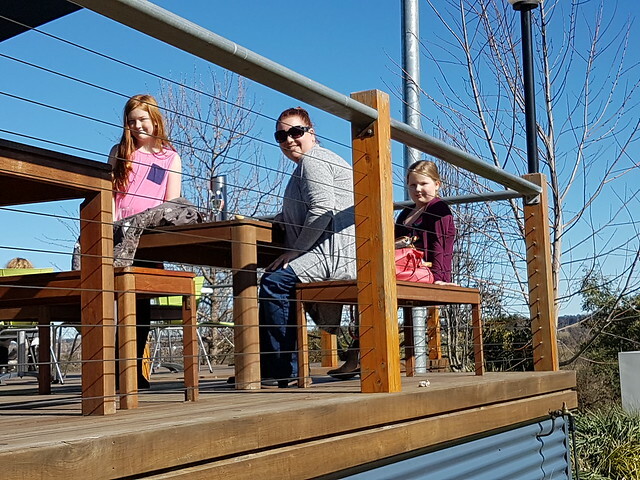 We were in the midst of one those beautiful Australian winter days. The sun was shining, the sky was blue and clear for as far as the eye could see. The sun was omitting just the required amount of heat that you could actually take your jumper off and enjoy the heat on your back. Let us talk Bullant Brewery Beer! Cameron quickly brought us the drinks menu. We chatted about beer and what type of beers I like. We learned that the core of the brewhouse itself actually came from Richmond Virginia, America. Unfortunately for The Richbrau Brewing Company, the global financial crisis struck causing the brewery to go bankrupt. 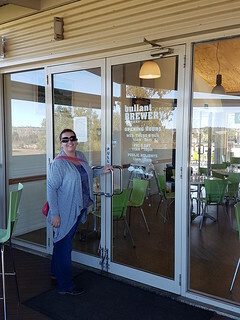 It, in turn, was fortunate for the Bullant Brewery as they were able to purchase the equipment and have it brought out to tiny little Bruthen. 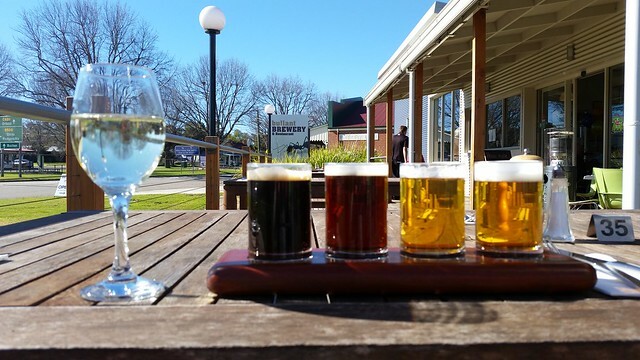 I settled for a tasting paddle where you received any four of the Bullants brews in 175ml glasses to sample. 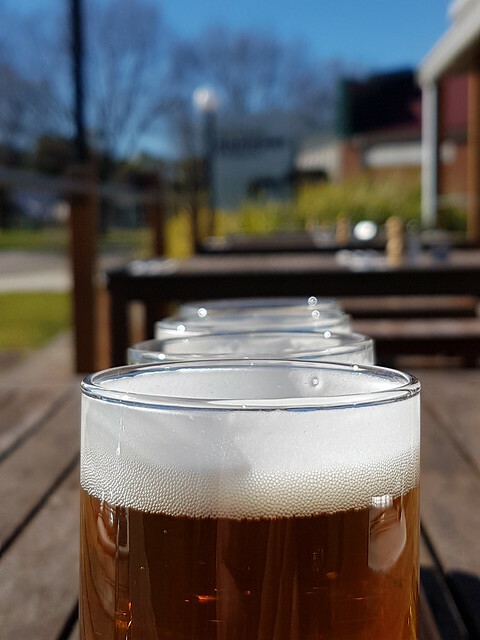 Being a fan of the European style of beers I sampled Bark Sheds Wheat Beer, Tambo River Pilsner, Pig & Whistle Brown Ale and the Piano Bridge Stout. Rebecca had a glass of Moscato from Blue Gables Vineyard. Blue Gables is located just outside our hometown of Maffra. The paddle is delivered to your table along with a guide to the beers you choose. You can read about the ingredients and the flavours as you sample the brews. The Piano Bridge stout was the standout number as far as I was concerned. It contained that slight bitterness that characterises any great stout but still subtle enough to taste light chocolate and caramel overtures. “Our beer is brewed from malted grain milled at the brewery, water sourced when possible from our 27,000 litre water tanks, a selection of the best hops and yeasts available. We will use fresh locally grown hops for our seasonal beers, when available. Of course all the ingredients are natural” Neil Triggs, brewer. 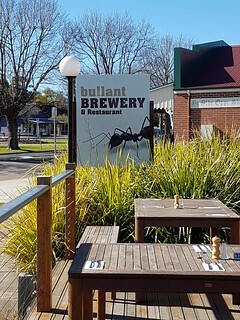 Bullant Brewery has 7 beers as its core range and features a few seasonable beers from time to time such as a Munchen Dunkel and a summer Kolsch. The beers range in strength from 3.6% through to 6.7%. Besides the Stout I raved about in the tasting paddle the Mossiface Pale Ale was outstanding. It was crisp fresh and easy to drink. The pint of this slipped down very easy. All the beers from The Bullant are named after local towns, area’s, bridges or landmarks. 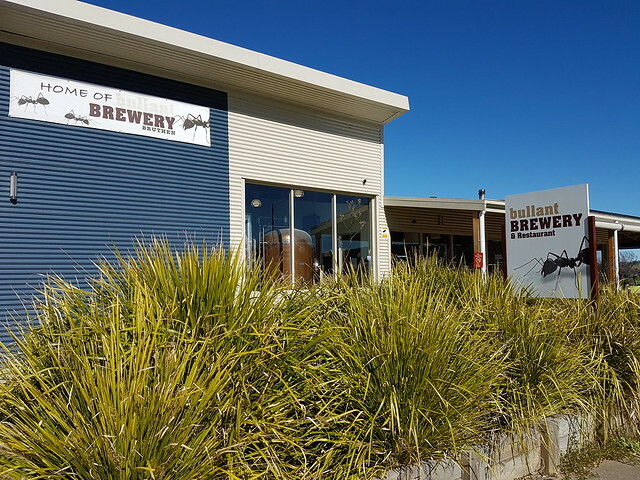 The Bullant Brewery is part of a collective called “Feast on East” that focuses on promoting food and beverage producers in the East Gippsland area. Bullant’s Bite which is the food side of the Bullant would have something to suit everyone. The menu stretches around 7 pages long. Everything from nibbles to deserts to platters for 2. All meals on the menu come with a recommended beer that suits the food and will help to enhance your meal. The menu tries to cater for all tastes. With Asian, Indian, Italian, English and Australian styles flowing throughout the menu. 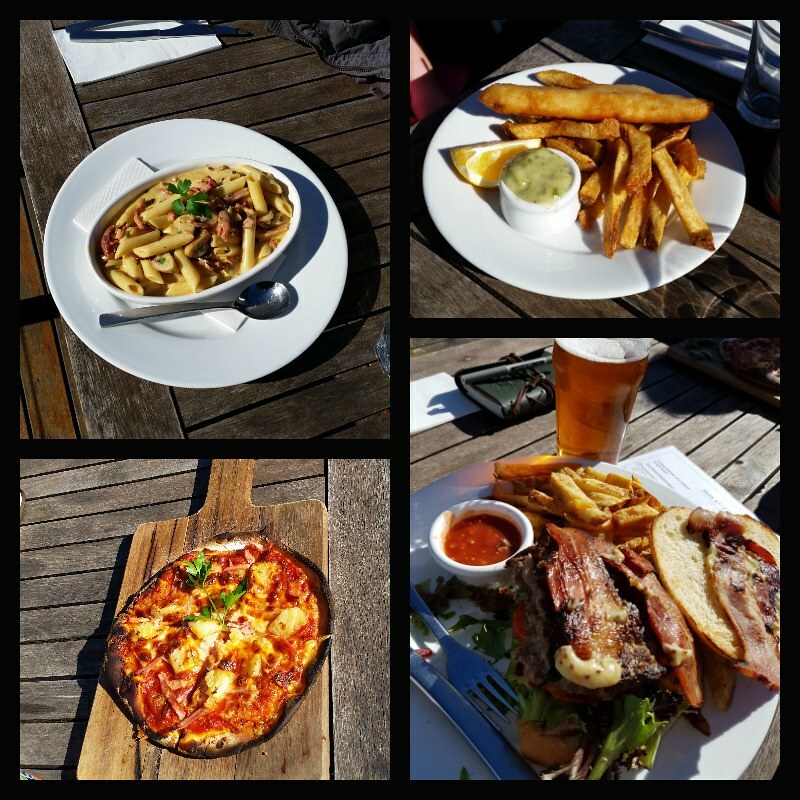 There is something for everyone at the Bullant. I must add in that the girls felt welcome and furthermore the Bullant is family friendly. They have a kids menu to suit featuring pizza’s, pasta and fish. Our children went with wood fired Hawaiian Pizza and the classic fish n chips. At around $10 the kid’s meal was a great value. 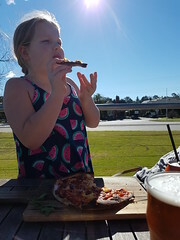 We have had wood fire pizzas before at other wineries the same size that cost $20 dollars, very impressed with the portion size for kids. I chose the Bullant Burger. A thick and tasty 250-gram house-made beef patty inside a homemade burger bun with tomato, beetroot, bacon, lettuce, onion jam and whole grain mustard mayonnaise. Served beside rustic cut, rosemary salted chips and finished with their famous Mossiface Pale Ale relish. This was fantastic and big.I was the last to finish my meal which is unusual. The rustic chips fried with their skins on made a great addition and the taste of rosemary and pepper jumped off the potato. Rebecca went for the carbonara al fungi, sauteed mushrooms and bacon in a white wine and cream reduction sauce. It was a really top quality Carbonara. Some carbonara is so rich that its near on impossible to finish. This Carbonara came with just the right balance of cream and cheese to make a delectable taste. As a result of the great food, four empty plates were present. This is a surprise in our family as our kids are usually very fussy but the meals were amazing! Despite being full I just had to have another pint of beer. I tried the summer Kolsch this time just to round off the menu neatly. Rebecca had a coffee and desert. Rebecca makes coffee for a living, you see she works as a barista, so she is pretty critical of coffee that others make. Bec gave the barista at the Bullant a thumbs up for her cappuccino. For dessert, we ordered apple and rhubarb crumble. It features a housemade crumble, using local granny smith apples and rhubarb. Finished by serving with vanilla ice cream. The kids could not get enough of the crumble on top and the ice cream. Poor Bec had to settle for the fruits inside. Where is the Bullant Brewery Bruthen? Yum! My mouth is watering, even though I just finished breakfast. The beer selection would delight my husband, but beer isn’t my thing. However, I do love coffee! Adding to my list of places to visit in Australia. 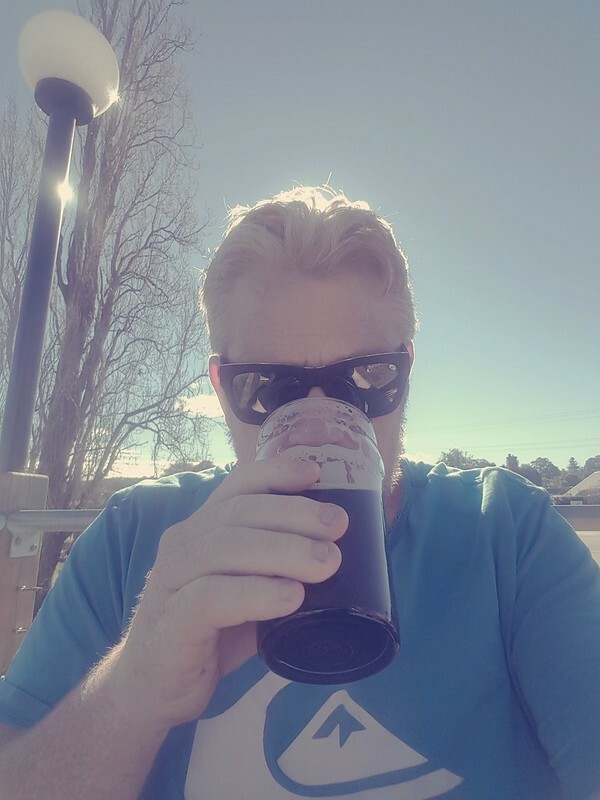 So far, I have a list of local breweries around Perth. Thanks to your post, I am expanding it continent-wide. Can’t wait another 2 months till we come to Australia. 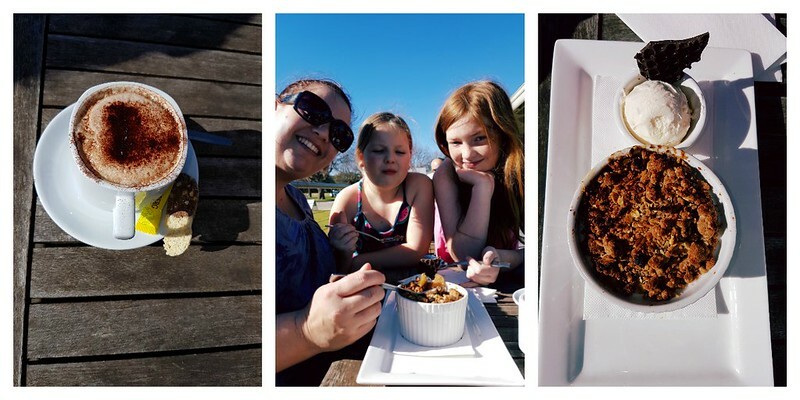 I think it’s nice that in Australia it’s easy to just hop into a car, and head out to a road trip on the weekends, and there’s always somewhere fun, something delicious and tasty with beautiful sunshine! Looks like a place not to be missed. Loved the photos and details. Seems like they had something for everyone’s tastes! Sitting outside with the sun shining and the sky clear and blue while nursing a mug of beer is quite close to heaven. On top of that you add some spectacular food and this is definitely the works. These small breweries are always so full of character ad you did a great job of capturing that both with your words and your photos. A wonderful find and a top pick for anyone who happens to find themselves in Bruthen. I really really love pub grub, and this looks like an excellent example of it. I didn’t head out that way when I lived in Melbourne. Regret it now after reading this!